Thanks... and your point is? Did you even read the OP. Or is this the usual mindless Trump deflection defence mechanism? Is there a letter from Clinton's Dr stating she would be the healthiest ever President? Is there a letter from Clinton's Dr with glaring grammatical, spelling and medical errors all over it? Come back when you read the OP and understand what this thread is about and stop the automatic "but but Hillary" responses. Troll. Wrong on both accounts. But keep posting this in every thread. I've been calling Trump obese since his Home Alone appearance. Maybe, just perhaps, the fact that more people are calling him that may have something to do with the medical records he released, you think? Ipso facto not a racist? Get out of here man. That's a childs argument against someone being racist. "I can't be racist, I have a black friend". Idiot. For all intents and purposes, Trump's doctor appears to be lacking in one or all of the honesty/intelligence/common sense department(s). And of course, the grammar is over the top to promote Trump's eligibility to become POTUS. If my doctor wrote that letter, I'd be a bit pi$$ed. It doesn't come off as medically professional at all. Did Trump and his campaign fake the letter? Don't know. Are the claims false? Don't know that either. But lets say the letter is fake. That proves that Trump is dis-honest. He probably tells lies now and then. Not good but it seems to come with the territory. IF he lies about the little things, he would most likely lie about the big things. Are you worried about his health? In all appearances, he is healthy. Trump should have been more serious about providing solid medical exam information on his overall health to provide to the public, eliminating the type of conspiracy this letter created, but he didn't. Or did he? Maybe that's the best he's got. Which in itself is a disappointment. At this point, after looking at the big picture and the alternative, I am still voting for him. Thats a fair post, don't agree with your outcome but at least you admit to the problem(even if it doesn't tip your vote). My issue isn't that he's too unhealthy to be President, it's like you suggested. If he's willing to lie, so blatantly about the little things, in such an obvious way that its a huge middle finger to everyones common sense then he just can't be trusted with any more "power". That's my issue. Thank you though for being the only Trump voter who gave a reasoned response and didn't try to ignore the lies. I accept your stance. And even if… by some Trump-devoted logic you decide to believe that Trump is 6’3” and only 236 pounds he is still borderline obese AND must have been obese before losing the 15 pounds he claims to have lost recently. where do you get the obese crap from? 236 pounds is 107kgs (im nz) ... I would never say trump looks more than 107kgs.. thats a big heavy guy. your ''fact'' is nothing but a poor guess! Did you even read your own chart you posted? I mean he weighs 236 pounds and is 6ft 3... allegedly. So he's no-where near the 144 - 180 pounds bracket you quoted. So that's a pointless quote. 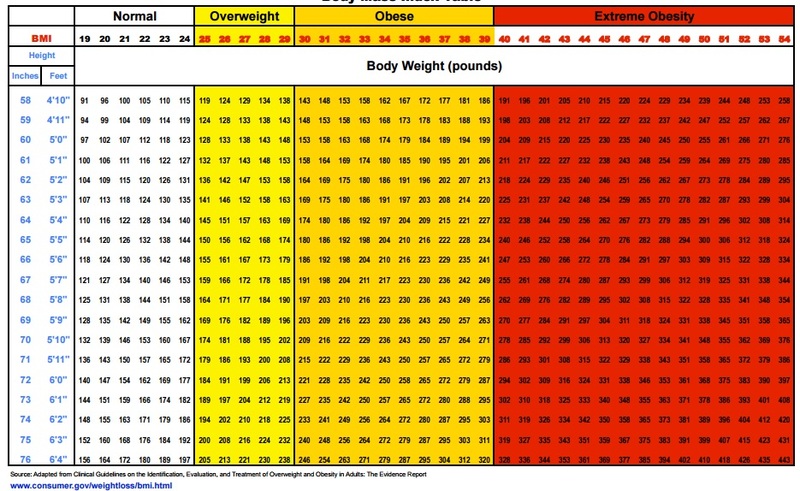 According to your own chart he is on the borderline between Overweight and Obese. So... that's where it comes from.